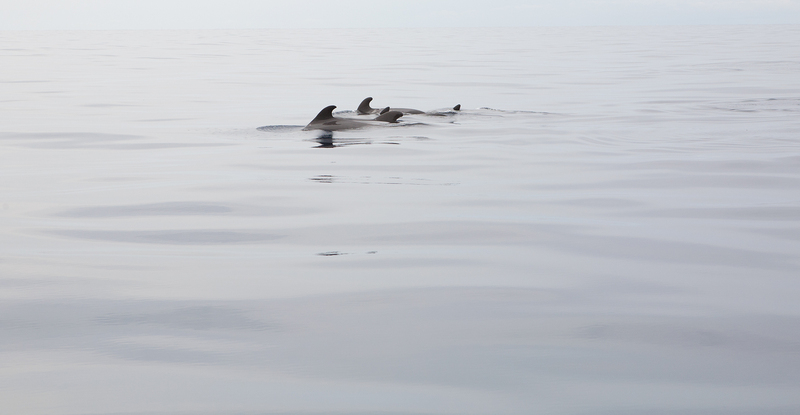 The South West coast of Tenerife is home to short finned pilot whales and bottlenose dolphins, which are the most expected species to encounter in our tours. Nonetheless, there are 31 cetacean species recorded in the Canary Islands, so it is not uncommon to see pods of numerous oceanic dolphins jumping all over the place, or solitary giants like baleen whales or sperm whales. If we are very lucky, we might get to see shy beaked whales, or majestic orcas. Every day is different and full of surprises! Yes! Sighting success rate is very high all year round. WWET guarantees to encounter at least one species of whale or dolphin for our three-hour tour: Be Whale Wise, and our two hour tour: Embrace Nature. Bearing in mind that wild animals are unpredictable, it can happen, at RARE times, that we do not see any. In that case, WWET offers two options: the opportunity to join us again on another tour for free, the day of your choosing as long as there are spaces available. Absolutely! Our environmentally friendly boat apart from comprising with all the safety features required by SOLAS (Safety Of Life At Sea), and CE Certification, it is specially designed as offshore category, navigating smoothly even on adverse conditions. For us safety is always first, and we only go out at sea at favourable conditions. Our captains are highly certified and trained, they will give you a safety talk and will answer all the question you might have previous to every tour. Yes, the tours include snacks and soft drinks. These vary depending on the tour. You are also free to bring your own if you prefer. Please no alcoholic drinks on board except for the ones served by us in our Unwind at Sunset Tour, or Private tours. Yes! Almost everybody can embark with us. In cases of young infants, pregnant women, those with major back or neck injuries, or reduced mobility, a decision is made and if applies a waiver signed, at the time of departure with the best interest of the guest comfort in mind. We provide child safety gear. We recommend that when travelling with infants (0-24 months) you bring a baby carrier. We are very sorry that wheelchair access is not available. •	WEET is run by fully certified expert cetacean researchers, giving you the opportunity to participate in their fieldwork, and to have all your questions answered. Also join them for Cetacean Sound Cymatic Research, a revolutionary methodology for the future of dolphin sound communication studies. •	Our boat is silent and environmentally friendly. Please see Our Boat Description for more information. •	WWET believes in responsible whale watching in every sense, and it is respectful with the animals, the ocean and the planet. •	Our boat has above and below action cameras, and you can take videos home. •	WWET has professional hydrophone systems to listen to, and make recordings of whale and dolphin sounds. •	Professional cameras, computer, pen drives and card readers are provided for you to use to make sure that you take home good quality digital memories of the trip. •	Drone Video service available, for you to have an amazing aerial video footage of the trip. Service at extra cost and pre-booking only. •	WWET provides a variety of different tours, that are not found anywhere else in the sector. Please check out tours description for more info. We are located at Puerto Colón, Pontoon 8, in Adeje, Tenerife, Canary Islands., Please check the map for more details. Public bus transportation available. Pay parking available at the marina, but please bear in mind that spaces are quickly filled. If you are having any problems locating or reaching us, please contact us and we will very happy to help you. WHEN IS THE CHECK IN? It is recommended that you arrive 15 mins before the departure.